Whole wheat naan spread with whatever kind of chutney I have on hand, wrapped around strips of grilled chicken. That has been our staple meal this summer. I sell lots and lots of chutney and naan at our Saturday morning market, so I usually have some made for our meals too. 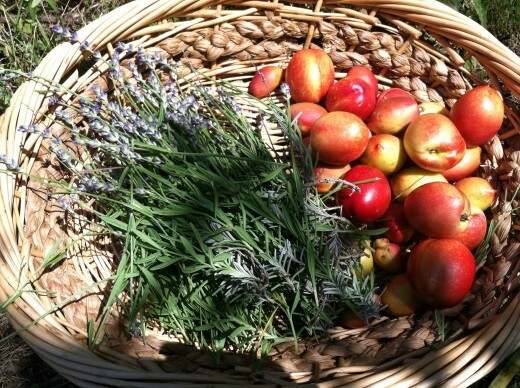 I developed my chutney recipe when our little nectarine tree produced in the spring. He tries hard every year, but freezes just when his little fruits are starting to expand. This year was different. We had a late freeze, but somehow the little guy was spared from the chill. 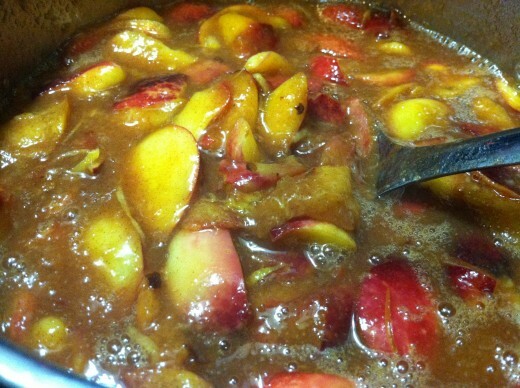 My first batch of chutney this year was made with the surplus of nectarines we were able to harvest from that one tree. 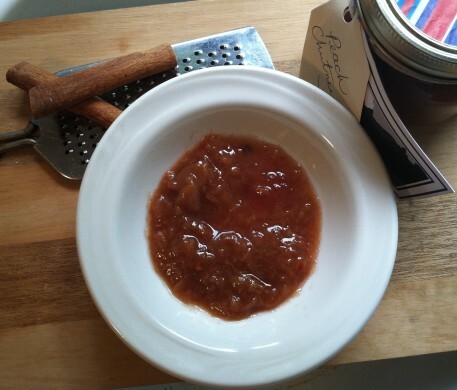 When the nectarines were all gone, I used the same recipe to make mango chutney. 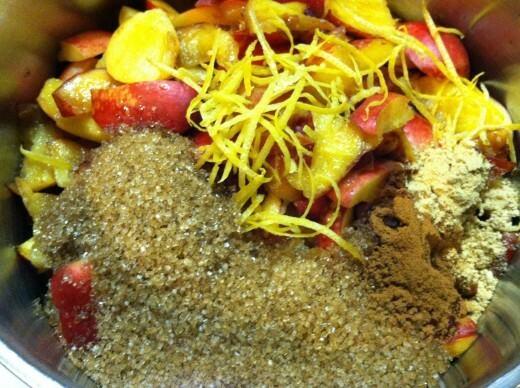 After the mango I switched to peach and have made maybe three big batches this summer. 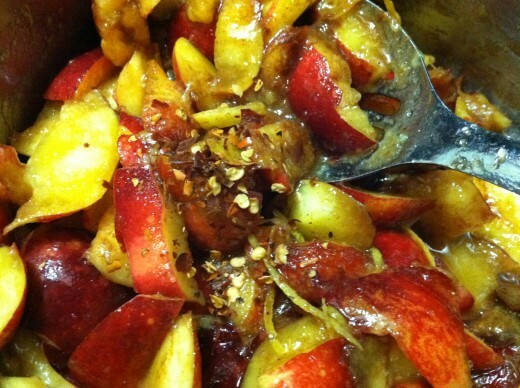 Combine all of the ingredients in a medium to large saucepan. 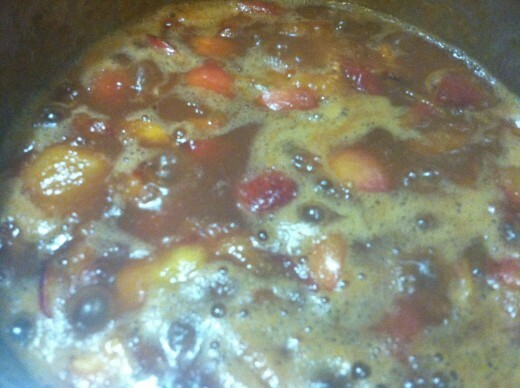 Cook over low to medium heat for 2 hrs., stirring occasionally. 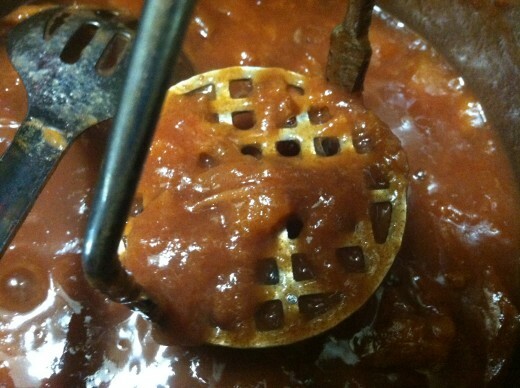 Crush the fruit with a potato masher every once in a while to smooth out the chutney as it cooks. 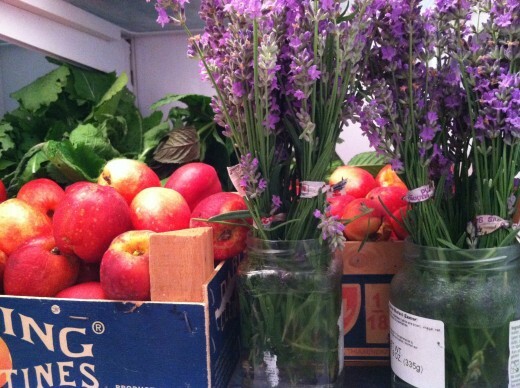 Keep refrigerated and use for up to three weeks, or process in canning jars for a one year shelf life. It also freezes beautifully. Note: If substituting mangoes, water must be added throughout the cooking process. They just don’t have the liquid content of peaches and nectarines. My husband and I were just talking today about how we like chutney and lo and behold, here it is!!!! Can’t wait to try it!